Every now and then, my friend Suncat will send along a lost item question. I get to practice horary, and there’s always the hope that the answer will help Suncat find the missing item. Since she and her husband have two cats, often what’s missing is a cat toy. This was true this past summer, when Gray Princess lost a toy mouse. There are several toy mice in the household, but “Mouse the Elder,” an unusually durable toy, had earned his name by having lasted for decades. Looking around the house for MtE wasn’t working. Suncat reported that he’d last been seen in the living room, but that was weeks earlier, and he hadn’t been found. Meanwhile, Princess wanted her favorite toy back. It was time for divination. So Suncat asked, “Where is Mouse the Elder?” and I cast the chart for the time when I received and understood the question.But I’d also heard that you can use Lenormand cards to look for lost items, and this seemed like a good time to try that. And since it’s faster for me to look over a few cards than to interpret a horary chart, I looked at the cards first. I didn’t have much experience at using the Lenormand this way, so I kept things simple. I decided to choose a card to represent MtE, then find the card in the deck and read a few cards around it to see what was going on. At least choosing the significator was easy: when you’re looking for a toy mouse called Mouse the Elder, what better card could there be than 23-Mice? When I found the Mice in the deck, I laid it out along with the card before it and the two cards that followed it. The Child “jumped out” at me as a card to pay attention to. Generally, the pictures on Lenormand cards aren’t all that meaningful in themselves. They’re mainly there to identify the card. But in this deck, 13-Child shows a child playing with a toy—in most of my decks, the Child is simply a picture of a child. This felt significant. I looked up the Child in Caitlín Matthews’s book, the only one I know of that talks about using the Lenormand to find lost items, and read, “your child has it; used for play; in a new place you’ve not looked yet!” (emphasis mine). Putting those together, I thought that MtE had been left in a box, drawer, or cupboard near Suncat’s books. By extension, that could mean an enclosed space, like between two groups of books or something like that, the sort of place a cat could knock a toy into and not be able to retrieve it. And it was likely that Princess had forgotten where MtE was and left it behind. So, was the chart going to support the Lenormand reading or give a different answer entirely? Where is Mouse the Elder? Suncat asked the question, so her significator is the ruler of the 1st house: Mercury. The 6th house is associated with small animals. Aquarius is on the cusp, so Saturn is Princess’s significator. Mouse the Elder is a possession, and possessions are associated with the 2nd house. If I were looking for something Suncat had lost, I’d look at the ruler of the 2nd house. But MtE is Princess’s toy, not Suncat’s, so we need to look at Princess’s 2nd house. Having just said that Princess is represented by the ruler of the 6th house, it’s like the 6th house is Princess’s 1st house. So the 7th house is like her 2nd house. Pisces is on the cusp of the 7th house, so Jupiter represents Mouse the Elder. Incidentally, there’s another possible significator for MtE: Venus, the natural ruler of toys. 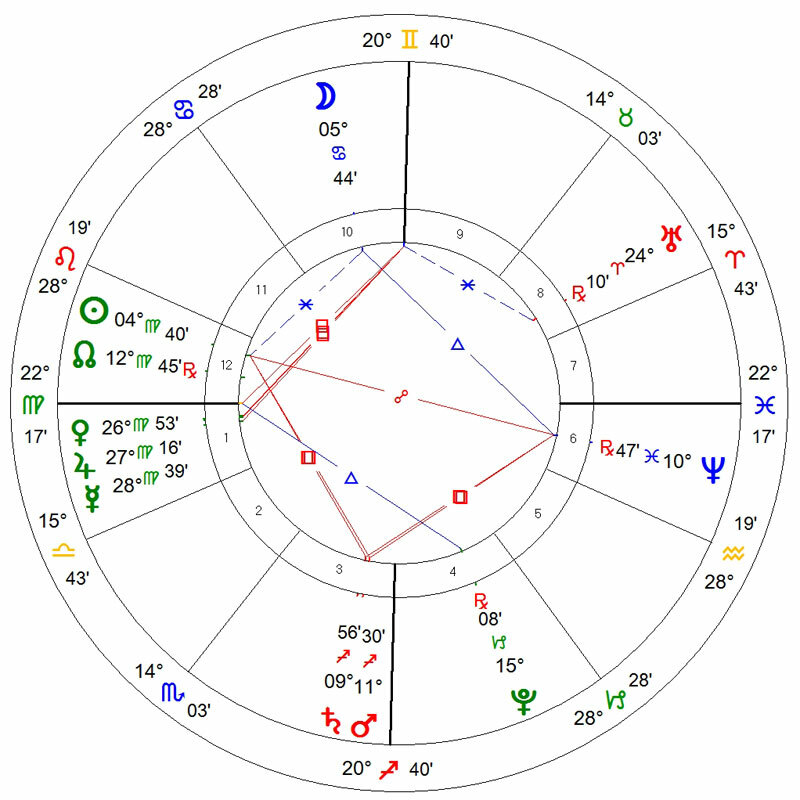 In this chart, Venus conjuncts Jupiter, so it’s also in Virgo and the 1st house. Venus is in fall in Virgo, so like Jupiter, it’s not at its best. Basically, it’s pretty much the same interpretation whether you use Jupiter or Venus. Cool. So whether the significator is Jupiter or Venus, Virgo and the 1st house should describe where MtE is. Virgo indicates that the lost object may be “inside something like a pocket or container…closets, desks, cabinets, where things are filed and stored, home offices, studies…” (Anthony Louis). Which sounds like what the Lenormand reading is saying: MtE was inside something. Virgo is an earth sign, which suggests that MtE is on the ground or near the floor. The 1st house is an angular house, which traditionally means that the object should be easy to find. (I’ve wondered about that—if the object is so easy to find, why hasn’t it been found already?) The 1st house also suggests that the lost object is where the querent spends the most time. I wasn’t sure if that meant Suncat or Princess in this case. A shipping box had been left in the living room for the cats to play with, and Mouse the Elder was inside it. The box was close to a bookcase. So there were the Lenormand elements: the toy mouse inside a box near books. As for the horary chart, MtE was inside something near where things are filed and stored (books), and the box was on the ground. I don’t know if either Suncat or Princess spends most of their time in the living room, but Suncat said that she’d only ever seen Princess playing with MtE in the living room, so that’s where she started her search. Of course, the most important bit is that Princess has her favorite toy back. 😀 But I’m also fascinated with how both the Lenormand and horary answered the question. We are now keeping a very close eye on Mouse the Elder, and quickly root him out when he disappears. It was fun to read this analysis again. And it felt good to get it written up in an organized fashion, all in one location. It appeals to my sense of order.